My postings may contain affiliate links, including Amazon.com & others, which means I may receive a modest commission if you click a link and purchase something that I have recommended. Your price won't change, but it enables free content here for you & supports my business. Read my full disclosure policy for more details. Thank you for your support! 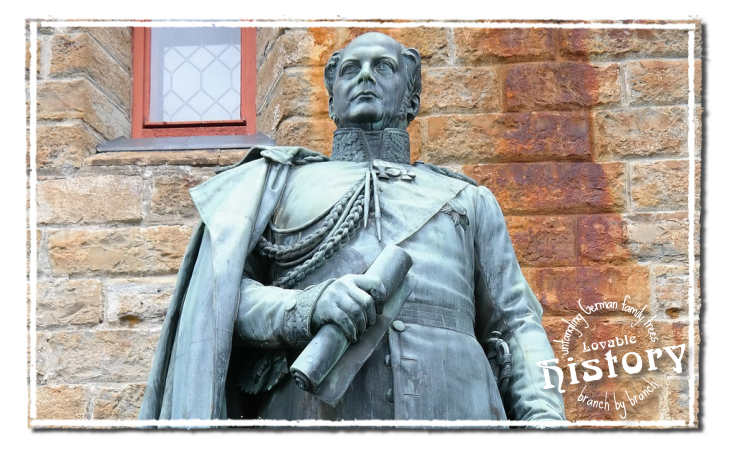 This article is part of the series “Get Familiar With German Given Names In Old German Script” where you will find similar articles about other German names, including name variations and examples out of old documents. 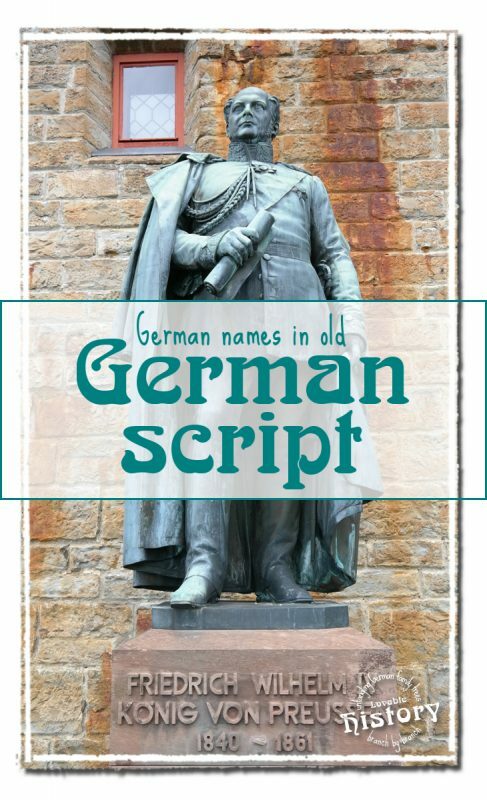 In this article we’ll deal with old German script Wilhelm resp. Wilhelmine. Some of the name variations are mainly used in certain German regions so it might well be that you’ll never ever see them in your own research. But according to “better safe than sorry” it’s not one of the worst ideas to list them all, don’t you think? Please have a look at the list below. Now let’s have a look at the snippets I collected for you. Of course I don’t have a snippet for each and every possible variation but I’ll add them when I stumble over them. Here and there you’ll notice that I meddled with the snippets. To make it easier for you to spot the single letters I erased all leftovers and cutoffs from other words and letters. 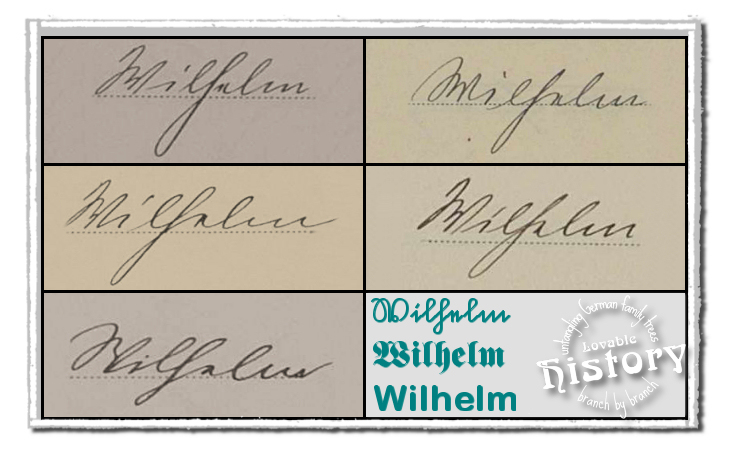 Several versions of the name “Wilhelm” in old German script. We’ll start easy. 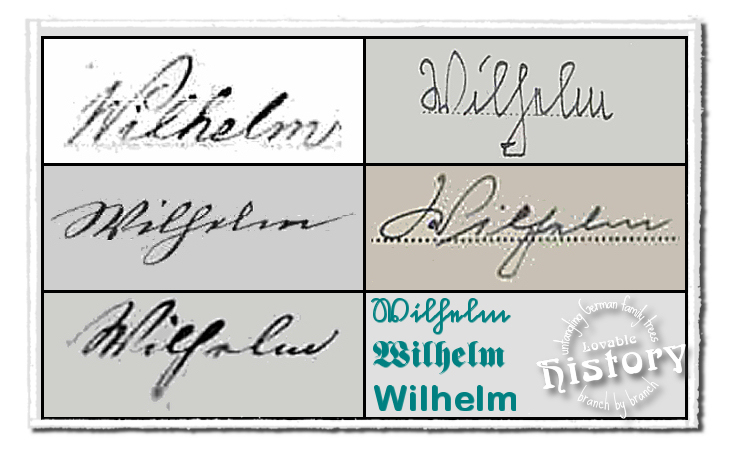 These are the first five versions of the name “Wilhelm”, all from church and civil registers between 1890 and 1940. I think the most difficult letter is the capital letter “W”. It slightly resembles an “M” in some cases. Please compare the “W” and the “M” to see the differences. Pay attention to whether you write the arcs and loops clockwise or counterclockwise. Another batch of snippets, again depicting the name “Wilhelm”. The first snippet should be fairly easy to read since it doesn’t use any Kurrent or Sütterlin letters. Snippet # 2 is Sütterlin par excellence, probably written by a very young clerk who just finished school. The third snippet also very much resembles the sample in the bottom right corner. It’s in italics, so those are Kurrent letters, not Sütterlin. Snippet # 4 has a very weird “W” and a crippled “h” with no visible top loop. The fifth and last snippet should be not too difficult to read, though the “W” is not a real beauty either. 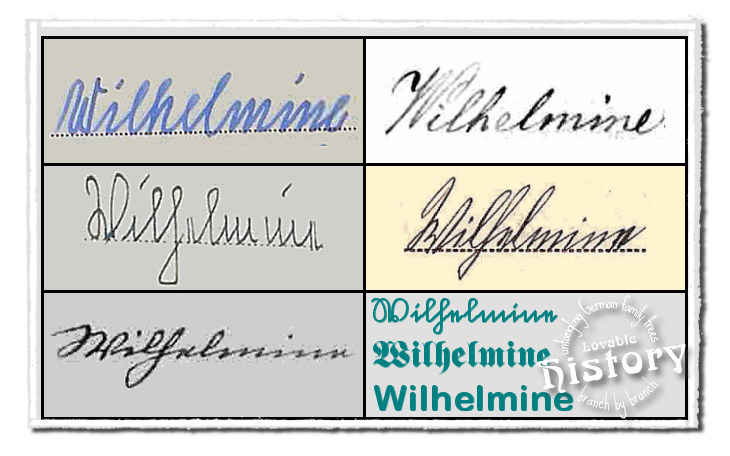 Several versions of the names “Wilhelm” and “Wilhelmine” in old German script. The first two snippets were written by the same clerk. Except for the “W” this handwriting is quite legible. The same is true for the third and fourth snippet. Nevertheless it’s sometimes difficult with female names to determine whether they end on “a” or “e”. These two end on “e”. The name in the last snippet looks a bit strange. Did you notice that the clerk or priest wrote “Willhelmine”? Not to mention the “W” which very much looks like “M” here… blergh! 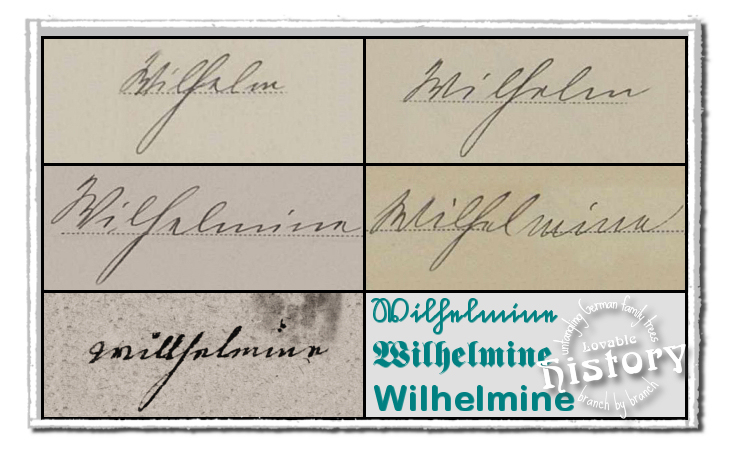 Several versions of the name “Wilhelmine” in old German script. And the last five snippets for the time being. The first snippet should be easy because they are Latin letters, not Kurrent or Sütterlin. Reminded me slightly of my own handwriting in primary school. Snippet # 2 is in Latin letters as well, but this time probably done by an older clerk or priest. The third snippet seems to belong to a young clerk who learned the Sütterlin script before 1941 (when the Nazis replaced it by Latin letters again). Neat and clean handwriting even though the writer doesn’t pay too much attention where he/she puts the dot/dash above the (second) “i”… The other four writers were more careful with that. Check on that for yourself. Snippets four and five are written in Kurrent script (italics). Also a very clean yet individual handwriting if you compare them to the sample in the bottom right corner. The capital “W” (as well as the “V”) is not really one of my favourite letters. If the clerk or priest had a very ‘individual’ handwriting, I usually skip the capital letter when I try to decipher the word. If it’s a halfway known given name or profession, the rest of the word usually helps me to determine what capital letter it could be. Kind of cheating, eh? But who says you have to start deciphering at the first letter and then continue strictly one after another…?